When Liz and Brian Espy bought the old art deco gas station at 311 Higuera St. in 2014, it was dusty and forgotten, with a five-year homeless resident sleeping out back. Passed over by modern times, the rundown building—with its broad carport awning and chipped white paint—hadn’t provided gas in 34 years. At one time a carpet store, and then a carpet storage facility, it had sat vacant. Chances are, you’ve driven right past the local landmark, known as one of the first service stations in SLO. It wasn’t much to look at. EXOTIC WINES MEET LOCAL LORE: Want to try a sauvignon blanc from Slovenia or get your hands on a rare local wine off the beaten path? The Station is SLO’s new unlikely neighborhood wine bar/hangout nestled in one of the area’s first service stations. Pictured, General Manager Jenna Congdon. Now, after about a year of restoration, this little slice of Higuera is turning heads for the first time since anyone can remember. Dubbed “The Station,” the once crumbling outpost boasts a teal-and-cream paint job, hip native landscaping, and energetic new tenants. 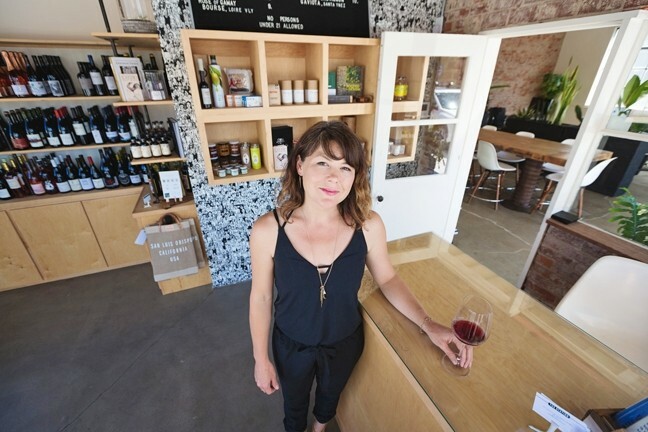 The swanky wine shop/workspace hosts wine tasting events, food trucks, and private parties. Shelves once full of motor oil and cigarettes now hold an extensive selection of fine wines and curated goods from around the globe. If only the old mechanics could see it now. When the history of a place is this rich, it makes sense to keep the narrative going. The couple also found out that the 100-year-old building next door, now home to their own business, Doghouse Promotions, served as the DMV and CHP office back in the 1940s and ’50s. “Old timers kept coming in and saying, ‘This is where I got my driver’s license,’” Espy said, adding that she also found a mass of railroad ties out back. Side note: It may be pure speculation, but a historically inclined friend believes the building might have been used as a service depot for narrow gauge Pacific Railway cars on their way from Spooner’s Cove to the railroad district. PIT STOP: The Station is located at 311 Higuera St. in San Luis Obispo and is open Tuesday through Thursday from 11 a.m. to 7 p.m. and from 11 a.m. to 8 p.m. on Friday and Saturday. Stop by to purchase wine from around the world, unique epicurean goods, or to sip wine by the glass. As I toured The Station, I too, was mesmerized by the history that glimmered in every detail. Exposed brick, polished concrete floors, and avocado-green tile (in the bathroom) come together to create a sense of what SLO looked like when ladies pin-curled their hair and Highway 101 didn’t exist (Higuera was the main thoroughfare). “The bones of this building alone are so cool,” General Manager Jenna Congdon said, adding that The Station business owner, Kimberly Walker, installed wood and cabinetry after moving in. That wood is sourced from old wine casks, so you can see the wine stains blushing throughout. Wine—imported wine—is the main focus of the business. You can purchase a bottle (the prices are clearly marked in white) or go for a glass. An industrial sign shows the day’s unique pouring offerings. During my tour, they ranged from a 100 percent Xarel.lo (pronounced cha-rel-low, it’s the main grape found in Spanish cava), a pinot noir from Burgundy, and a local Sangiovese. “I always aim to put on something that people may be familiar with, but from a region they are not familiar with—like a sauvignon blanc from Slovenia,” Congdon said. Although the focus is on international offerings—including Spanish, French, Austrian, and Hungarian wines—The Station boasts plenty of friends in the local wine community. Imagine: local friendliness meets exotic offerings. I recently attended a Scar of the Sea wine tasting event at the new hangout where winemaking partners Mikey Giugni and Michael Brughelli poured and chatted with the crowd casually. Based out of Santa Maria, the winery plays with wine grapes (and apples) from Santa Ynez to Paso Robles. What I saw was exciting, especially because I live in the area: Tacos were being served out front, people sipping wine and laughing inside the workspace/hangout area, once a garage for servicing cars. The sun sliced through the glass roll-up doors casting an ethereal glow on tufts of fresh greenery and thoughtfully curated items (artisanal cocktail accoutrements! Artisanal shrubs!). NEXT EXIT: THE STATION: On Sept. 23, experience a vermouth flight with a side-by-side tasting and leave with a recipe for making your own vermouth. Get your grub on with Taco Tuesdays featuring Granada Bistro’s Gypsy Wagon each week. Also on Tuesdays, wine, hospitality, and food service folks get 10 percent off anything in the shop. This Oct. 1 through 10, stop by for brats with German wine flights and beers every evening from 4 to 7 p.m. For more information, visit thestationslo.com. Full disclosure, Congdon is a Santa Cruz native who has lived on the Central Coast since 1997. The former Talley Vineyards wine rep is not trying to stuff the idea of “cool” down local throats. She just wants to supply the wines, ciders, and cocktail products she would want to buy herself. Along with nearby Appendage and Bough, which sells handcrafted furniture made from reclaimed wood, the quiet industrial borough is becoming more than a patchwork of rusty warehouses and corrugated metal. It’s becoming … hip. Take that however you want, but it’s happening. And yet, it’s not just hip for hip’s sake. This wine—and wine shop—is certainly stylish. But, as with the history of the place, there’s just as much substance to go around. Hayley Thomas is picking up scratchers and a soda at hthomas@newtimesslo.com.